Hi my name is Sherry and I saw a comment that ya posted on another auction about ya writing about antiques and collectibles online. I have been in search of someone to talk to about some pictures I have that were left here years back. My nephew was living with me as well as his girl friend. When they broke-up she left plenty behind. My nephew thought I had burnt all that was left. He freaked out and said there were photo’s that cost a lot of money, because they were some of the Charmin Toilet Paper Girls. By the style clothing that are being worn in the photo’s I can only assume they are from the 50’s – 60’s maybe older. I do not recall commercials from back then, so I have no idea if these are even worth anything. Is there away ya might be able to help me figure these photo’s out? Thank You in advance. I was pretty sure what Sherry had were prints, but since she had called them photos I was glad she had sent me some scans (some of which I’ve included here). And prompting the corporate response to sell the prints. 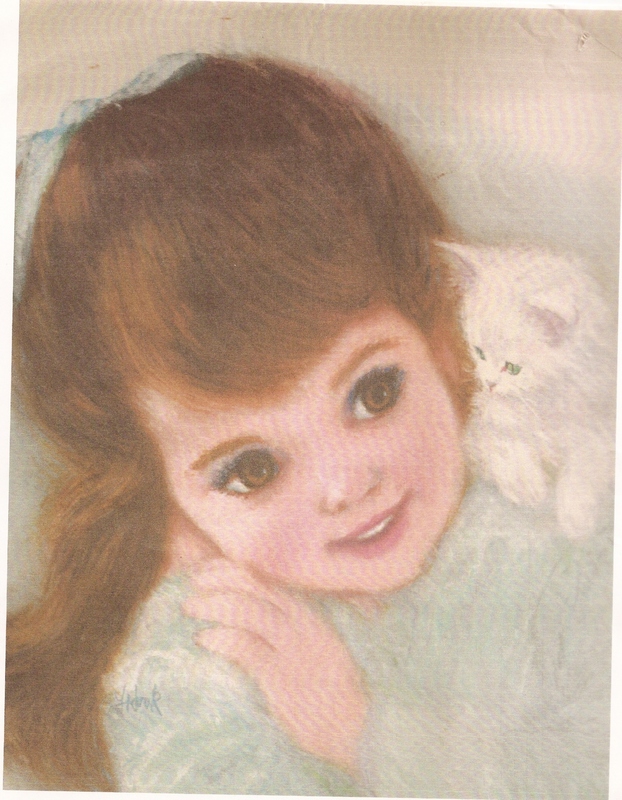 The first American Beauty prints were available as a set of four: one baby girl and three little girls. 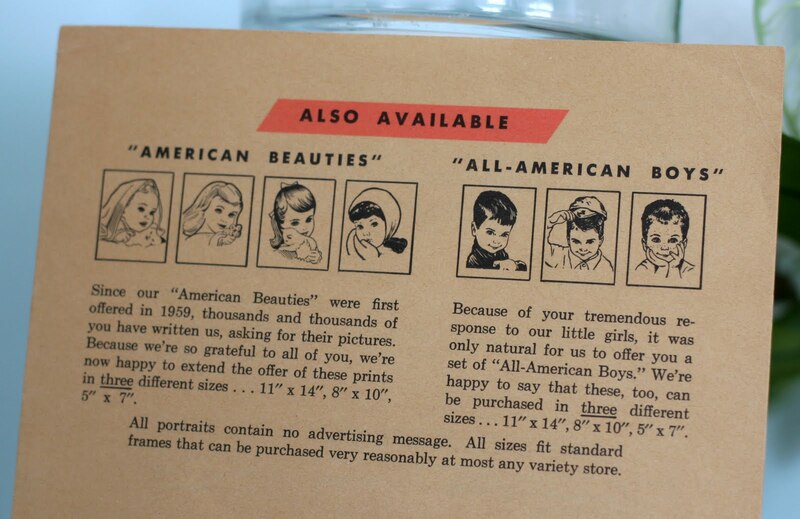 Not long after, the company released Northern Towel’s All American Boys, a set of three prints of little boys. 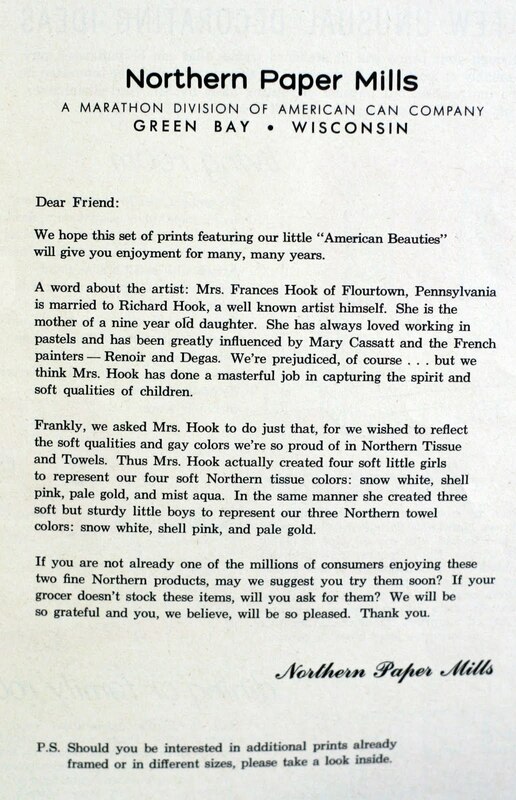 Not much later, Northern asked Hook “if she would take our little “American Beauty” girls and cast them into some fresh new poses” — for both the toilet tissue packaging as well as an additional print set (also four prints). That would bring the total of American Beauty girl prints to eight. As far as I know, the All-American Boys series remained at three prints. Which brings the overall total of the Northern prints by Hook to eleven. All prints were available in multiple sizes: 11″ by 14″, 8″ by 10″, and 5″ by 7″. Generally speaking, the larger the quantity of art prints (and anything else) made, the less the value they have. 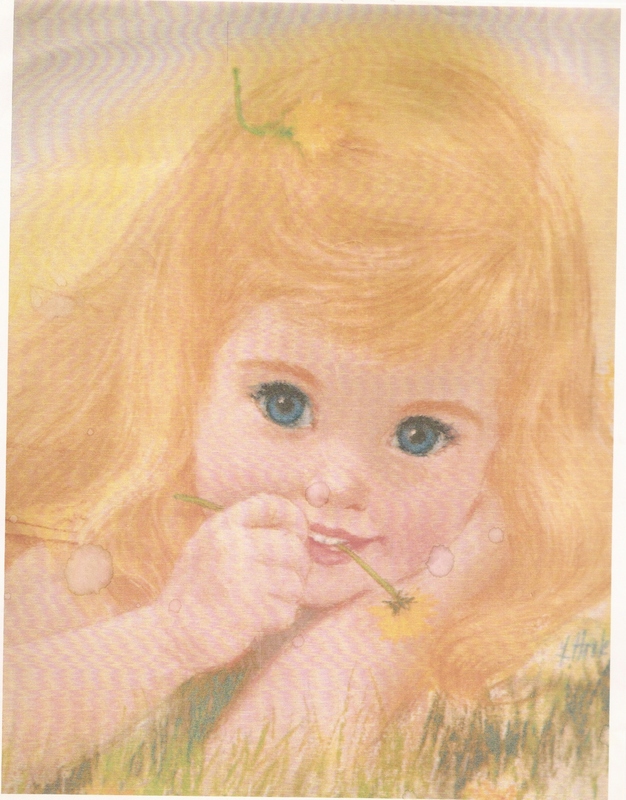 According to Georgia-Pacific, who now owns the Northern brand, “Offers for prints of the girls and Northern Towel’s All American Boys break records with 30 million sets of prints being sold by 1966.” Which means there were and still are a large number of these prints out in circulation. However, as these pieces are advertising collectibles, they do have some cross-collecting appeal. Again, these prints are a bit less desirable as they were mass produced — as well as more likely to be saved — which means more of them are available. Like most collectibles, these prints come and go in popularity; which means the prices go up & down. Because they are desired primarily for the nostalgia (“I had those prints in my bedroom!”) or a sense of nostalgia (“I love those vintage baby prints!”), their ability to match decor or gender of child for a specific room, the size of the prints (available wall space), and/or for the appeal of individual images themselves (one may look just like their son or grandson, etc. ), prices can vary quite a bit for each print. And, of course, condition of the print itself matters; not only in terms of tears, creases, spots, etc., but in terms of the color of the prints, such as fading of the colors or tanning of the paper itself which weakens the contrast of colors (and usually the strength of the paper itself). Those prints with spots and damages on the faces especially will likely have no interest (no value). However, someone, on Lista or elsewhere where you have no seller fees, might want these imperfect prints for altered art or collage projects. Depending upon the condition of the paper, etc., right now they could be worth anywhere from $1 to $9 a piece in today’s market. How do I get that value range? Based on the information discussed above and years of dealing in collectibles — and by getting a “snapshot” of the market by using eBay. I looked at current sales of these prints as well as recent past (closed) auction sales values, searching for Northern American Beauty prints by Frances Hook , and variations on those words. I also checked searches for Charmin print — as a great number of folks mistakenly think these prints were put out by Charmin toilet tissue. You can check eBay for current and very recently closed auction sales prices too — anytime, for anything. You can also use Price Miner. Checking periodically does take time, but that’s the best way to see if there’s an increase in demand or a decrease in offerings of these prints — both of which will mean higher prices. If and when that happens, you might want to list them for sale. The prices may rise again; a few years ago, I sold individual prints for $10 to $29 each. 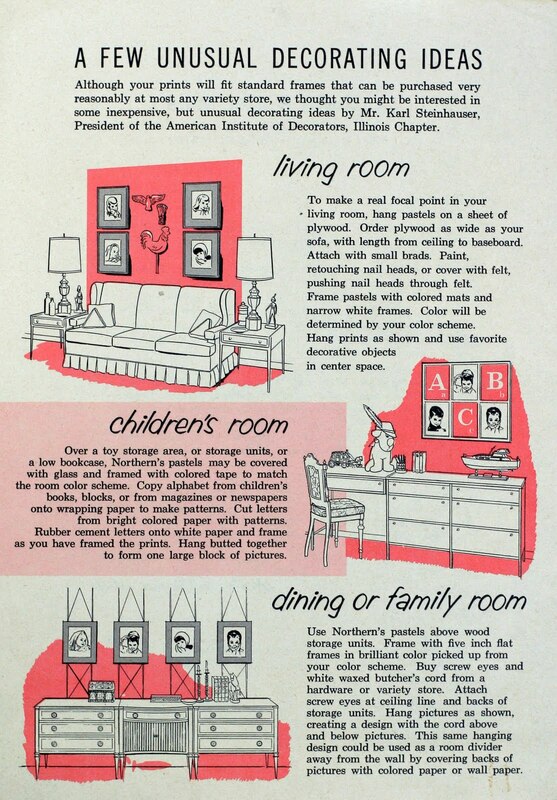 You just need nostalgia and or the appeal of sweet charming children to sweep back into home decorating again. Good article, however, I have a total of 12 different pictures all framed & matted. I contacted the home office, and they have only 8 hanging on their wall. I also have another set, but not with 12. I have the original package also. How does it come up with 12 all different, and you are saying only 7 or 8, ????? Well, Juel, without seeing them, I certainly cannot say. It is possible they are “in the style of”, or other works by the artist but not part of the series, or you have rare ones… I can’t say without seeing them. follow-up on the prints of 12. These are all 11×14 on card stock originals. Beautifully mounted by professional. Again, ALL PRINTS ARE DIFFERENT, and I am wondering how I have 12, and listed show only 7.?? They all came at the about same time from Northern Tissue. The original 7 complete, 2 sets, and not sure about the others, but I do know that they all came from Northern about the same time. Weather it was in a different package, I am not sure. 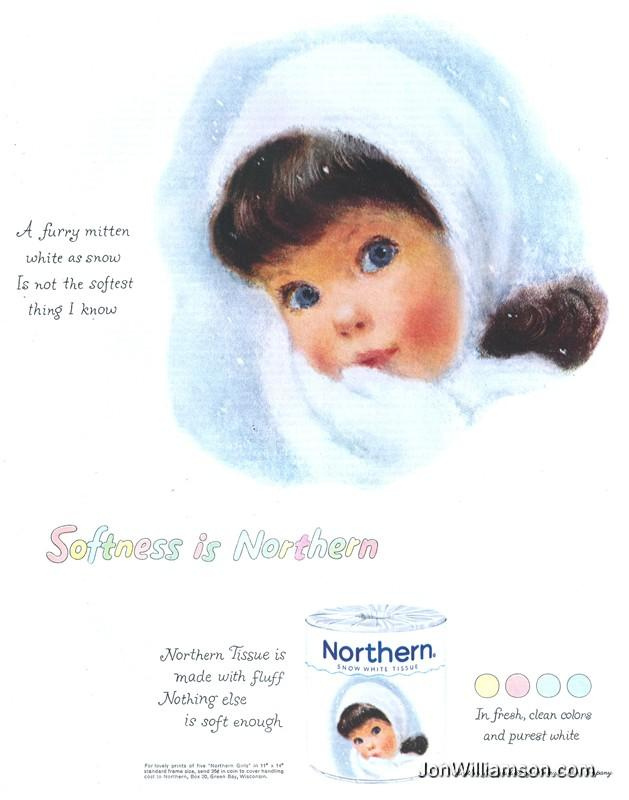 I was an art director for Procter & Gamble, in the late late ’50’s, ’60’s 70’s and I hired Frances Hook to do a DOWNY Fabric Softener ”Girl” – during that period. Unfortunately none of her beautiful illustrations was ever used. Too bad, I think. The one I have with the little girl in the snow has her hands out catching the flakes. It doesn’t look like the images I’ve seen online. I have a set of prints still in the box they were shipped in. With my dads address on it. 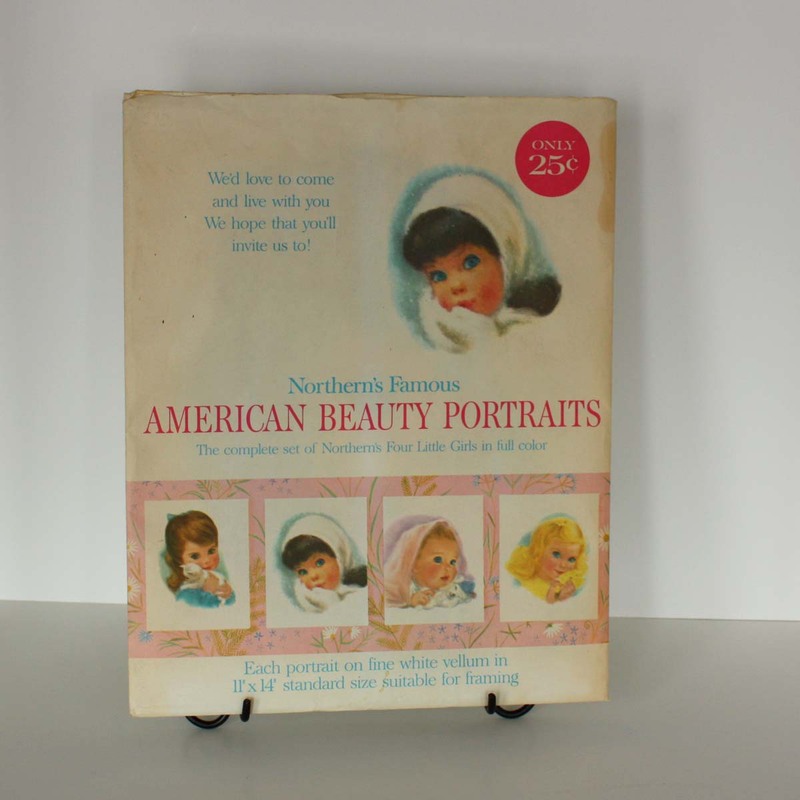 From Northern Paper Mils, in Hinsdale, ILL.
We have a perfect set of Northern Famous American Beauty Portraits of the four little girls with tissue still between portraits in original package. Cant believe they are worth $9 each. R U Serious? They are 57 years old. I have a set of 5 in the original packaging that I believe have to be at least 50 years old. Market price is dependent upon how many are available — and how many people want them. Age alone (and condition) are not the only factors. I have a set of the 3 northern boy statues that my father got while working there. It seems no one talks about these. Are they of any value? I have never seen the statues, Lynn. Have any photos to share? I have a set of the boys figurines as well. The are from the “Your Handy Helper” series. I have not been able to track down any information on them. Unfortunately, the head on one of them broke off and had to be glued back on. Otherwise, they are in very good condition as far as I can tell. I can send photos if you are interested. Yes, Steve, we love photos! My aunt wrote religous greeting cards and knew Francis Hook. My aunt asked Mrs Hook to do pictures of my sister and I and she did. Any idea on the value of these orginial paintings? We also have one other orginal that Mrs Hook did for my parents. Any information would be appreciated. Thanks. How cool! Those likely do have some market value. But at Inherited Values we won’t appraise or give you values. I do offer my personal services, for a fee, here; sorry, but there’s just not enough time to help everyone for free. We also recommend using PriceMiner, which may help if others have sold similar works. FYI, you can learn more about appraisals here. 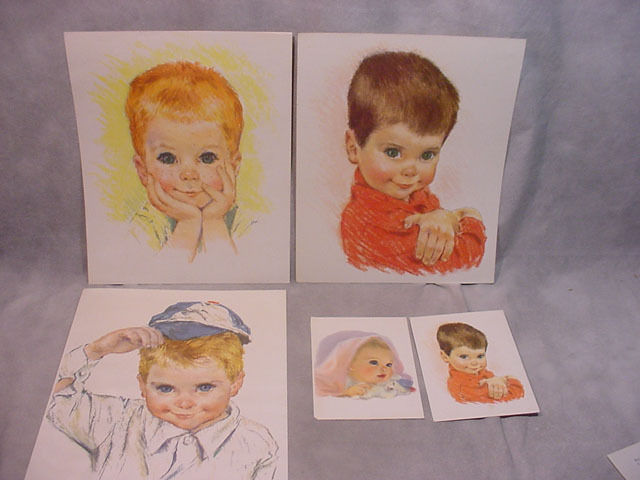 I had a set of wide-eyed “mod” kids in the late 60’s or early 70’s from one of the tissue companies. I would love to see pictures of them again, and possibly find copies of them. Can anyone help with this?